"Mom, you are almost as big as grandpa!" 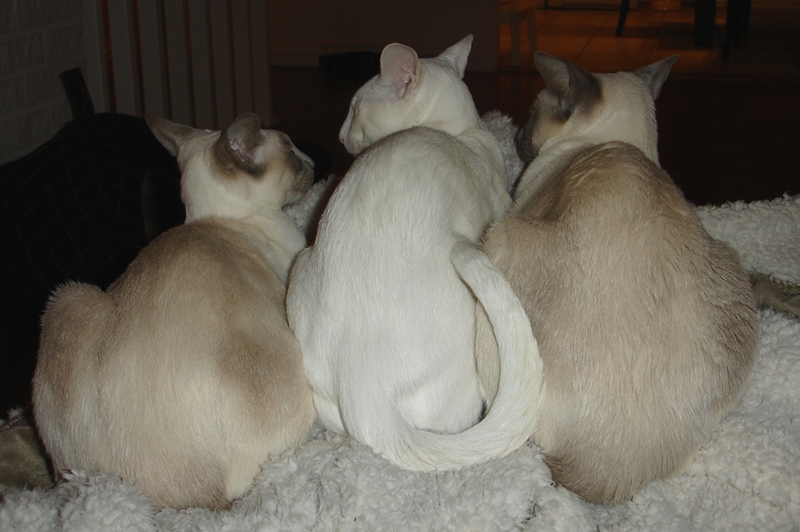 Jossan, Albert and Leroy were resting on their favorite blanket last evening. Jossan is much smaller than Leroy otherwise, but now her weight went from 2,9kg before the pregnancy to 4,1kg. There is about 10-13 days to go. I think that there may be six kittens this time, but I do not know for sure. Jossan’s weight gain was about the same as before, a bit lower, but that could do with a two days error in the estimated time of arrival. I cannot wait for the kittens to arrive! Lovely photo! Looks like they are all conspiring together with their backs to you !! “Don’t show that we know she is taking that photo … just turn around and pretend to be surprised ! !” Don’t ask silly questions .. just do as I say, I AM your grandfather you know !! ” lol!!!! Yes, sometimes they do like they are having quite complex conversations! 🙂 They are real pack animals, it is so much fun to study their behavior. Jossan is feeling great. Her tummy is enormous and I find it fascinating that she is still moving and jumping around so elegantly and graciously.